The idea of interpreting classical songs not with „artistic voice“ but jazz arrangements is again – this is her 3rd project- a charming challenge for singer and producer Gabriele Aigner. Classical songs from the baroque era (e.g. Antonio Caldara, Georg Philipp Telemann) through romantical representatives such as Robert Schumann, Johannes Brahms until the threshold of lateromanticism/and modernity (Claude Debussy, Rudi Stephan) get a new outfit. With the magnificent support of Austrian musician and arranger Hermann Miesbauer she uses her best endeavours to create an ambitious ,charming and emotional peace of music with a predominantly swinging , easy-going quality. Besides mainstream trend also unusually exciting sounds such as in the song „Panterlied“ a mixture of modern classic and „Up tempo“swing, in the „Barcarole“ a seldom 9/8 jazzrock version or „Weg der Liebe“ („road of Love“) a fusion/latin inspired by the eighties. The possible approach to the lyrics,the poetical base is- as you can easily hear - a primary goal for the vocalist Gabriele Aigner, she enthralls with clear articulation in her singing and especially with her impressive versatile voice, that gives every song a different character. Her singing enjoys the excellent support of wonderful and extraordinary austrian musicans g.e the lively trumpet playing of Gerd Rahstorfer, a bonfire! 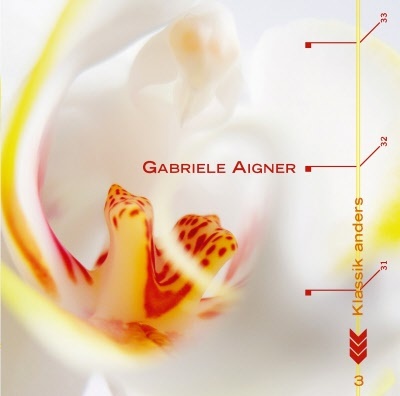 In short: The CD Gabriele Aigner Klassik Anders 3 provides a varied facinating peppy as well as sensitive and sophisticated music, lighthearted feelings with humour and snappy ease laced with a dose of dreaminess and melancholy.